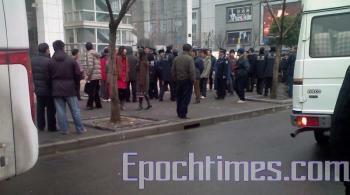 After 24 days of failed appeal to the town government, two hundred farmers from Maqiao Town went to Shanghai on January 7. They visited the Shanghai Appeal Office and the Shanghai City Commission before they went back to Maqiao that evening. Since December 15, 2008, the farmers had protested in front of the Maqiao Town Hall and wanted compensation for the 13,000 acres of land the government expropriated from them. No one from the government gave an answer. Having no choice, the farmers went to the Shanghai Appeal office and requested the city to follow the laws and provide them with compensation for the lands expropriated. During the 24 days when the farmers protested in front of the town hall, the authority mobilized a lot of police to the scene. The police arrested and beat the farmers and threatened them if thet did not discontinue the protest. The farmers’ protest alleged that the Maqiao town officials Chen Liangyu, Han Zheng and Huang Jun colluded with a developer in Qizhong Village Gao Fengchi, and expropriated 13000 acres of farmland. The farmland was said to be used for the Liangyu Construction Project to build the Shanghai Qizhong Forest Sport Complex. It’s been five years and all the farmland has been left left wasted. Over 3000 houses were demolished. Many farmers live in debt as a result.